If you were asked to name a classic Christmas-time story, what comes to mind? Charles Dickens’ A Christmas Carol or Frank Capra’s It’s A Wonderful Life? Ever heard of Illatszertár (translated as Parfumerie) by Hungarian playwright Miklós László? Most people will be familiar with the storyline but may not instantly associate with this “obscure” romantic comedy. Its ideas have been pilfered for three successful movies and an even more splendid Broadway musical. The adaptations center around two people with a tumultuous real-life working relationship, but have unknowingly fallen in love with each other as secret pen pals. Sound familiar yet? Modern audiences will recognize this plot from Nora Ephron’s 1998 film, You’ve Got Mail, starring Tom Hanks and Meg Ryan. Previous movie adaptations have also featured blockbuster actors of their era: Jimmy Stewart starred in Ernst Lubitsch’s 1940 The Shop Around the Corner and Judy Garland headlined Robert Z. Leonard’s 1949 In the Good Old Summertime. In 1963, Parfumerie was turned into a full Broadway musical dubbed She Loves Me. 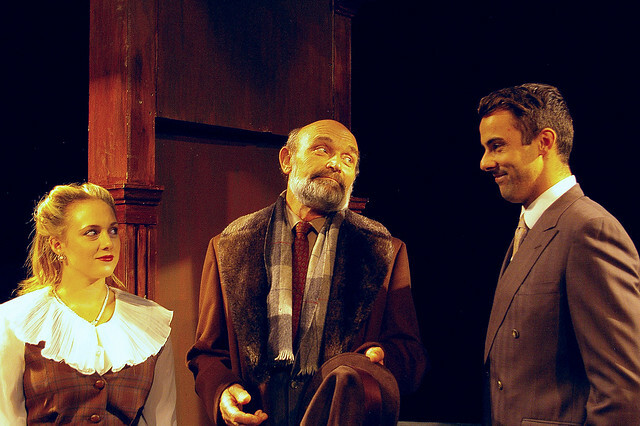 For English-speaking audiences, László’s original Hungarian play squatted in the shadows of these more famous productions. László and his wife, Florence, collaborated on a translation in 1956 however it was clumsy and literal, many of the jokes falling short. In 2009, E.P. Dowdall, László’s nephew and head of his literary estate, published what he considered the truest adaptation of his uncle’s original work. 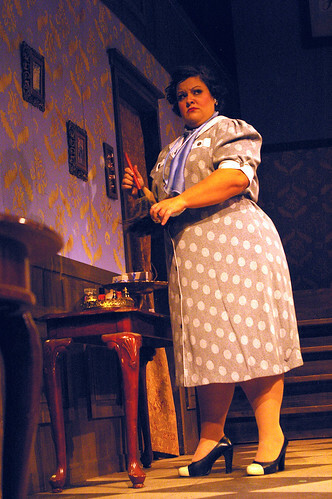 While remaining faithful to the storyline, Dowdall utilizes English vernacular and polishes up the quips. In that year, North American audiences were finally treated to the nostalgic charm of László’s play in its entirety. 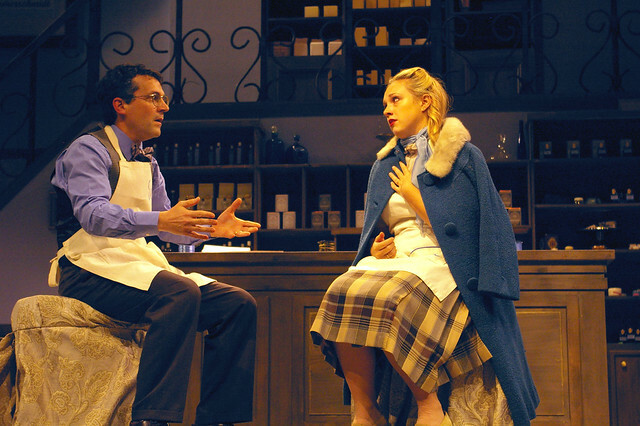 László’s play is rich with vivid characters engaged in humorous, often self-inflicted, mishaps. Although set in 1930’s Hungary, holiday themes of forgiveness and hope will still strike a nostalgic chord with contemporary theatergoers. 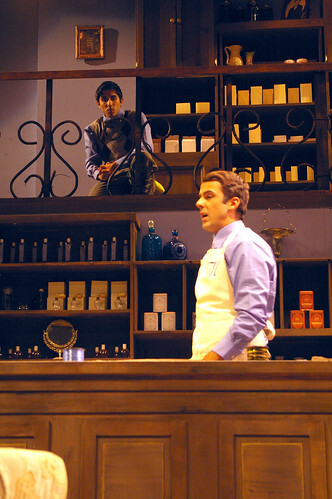 The scene on Vancouver’s Metro Theatre stage opens in Hammerschmidt’s Parfumerie, a shop that sells premium skin care, perfumes, and hygiene products. The set (Set Designer Kathleen Hilton, assisted by Tracy-Lynn Chernaske) is meticulously detailed and beautifully captures the wistfulness of a 1930’s parfumerie shop in Budapest. Antique tins and delicate bottles adorn the shelves while a warm brown palette is used throughout the space. The well-tuned cast, nimbly scampering about, is scrumptiously adorned by costumes selected by Shelley Stewart Hunt and Anna Kramer. Business is bustling during the hectic Christmas season but there is discord in the store. Shop owner Hammerschmidt has been secretly tipped that one of his employees is having an affair with his wife of 35 years. He is particularly angry and vindictive towards George Horvath, his faithful employee of nine years, because he suspects that Horvath is the “other man”. Unbeknownst to Hammerschmidt, Horvath has already fallen in love with an anonymous pen pal and has been corresponding with her for over a year — with no idea who she is. Meanwhile, unbeknownst to Horvath, the “anonymous” writer is actually his real life co-worker, Amalia Balash, whom he claims to detest. The two engage in many comedic rounds of vocal sparring as the other shop employees, Louis Sipos, Steven Kadar, Ilona Ritter, Elizabeth Molnar, and Arpad Novack try to navigate around the minefields created by Hammerschmidt and Horvath. 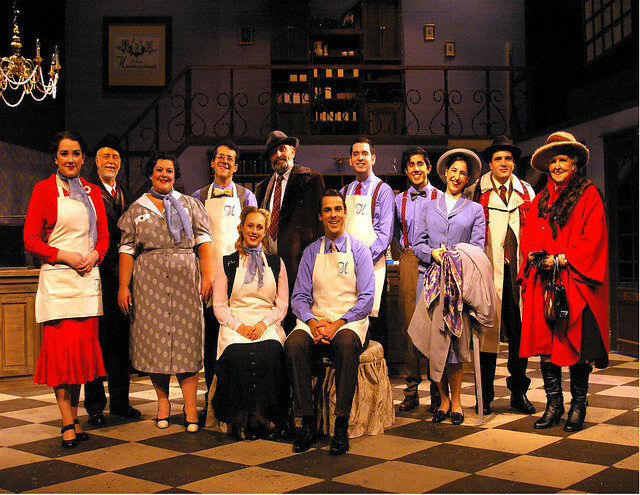 The cast scored enjoyable performances of all their characters. The opening scene of hustle and bustle marched like clockwork and hinted at the flow for the rest of the play. Bill Murdoch was sincere as the stern yet distraught shop owner with a golden heart and crusty exterior. The audience should find themselves as drawn to his marital plight as to the woes of the young lovers. Vincent Leblanc-Beaudoin is adorable as the bewildered Horvath and Lauren Dutchak is delightfully sweet as the sensible romantic Amalia. However, their onstage chemistry fell a bit short of emulating passionate sparks of love or hate. As the perpetually-frowning Sipos, Stefan Winfield was able to sympathetically convey his character’s cautious sensibility but with much comedic effect. Devon Sandhu’s high-energy portrayal as the eager Arpad is both hilarious and cheeky. Sandhu is laugh-out-loud funny when his character becomes officious just after he is promoted from delivery boy to clerk. 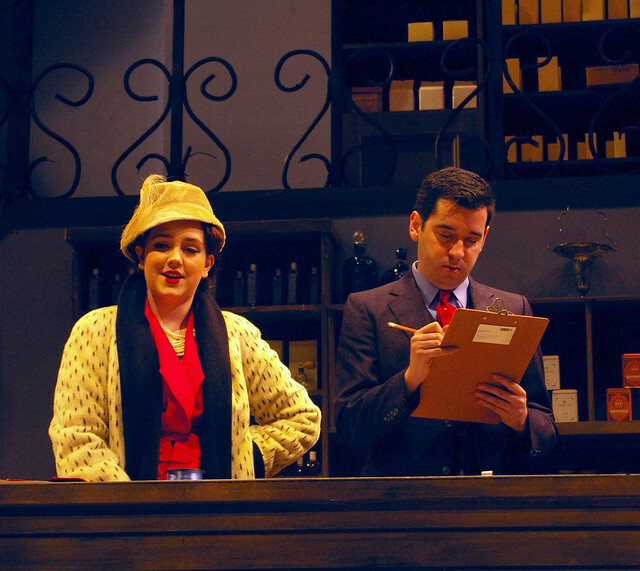 Metro Theater’s production is a tender treat to watch from start to finish. The ideas in Parfumerie are much like a multi-layer cake, with love as its main-theme ingredient. There is a layer showing love that is stale and cheated upon; a layer where love is new and misunderstood; a layer of love that is reliable and faithful; and alas, a love that is self-serving and pretentious. The cake is held together by the rich icing of loyalty and plentiful sprinkles of self-worth. There is much to cherish and discover in László’s play as it was originally intended. 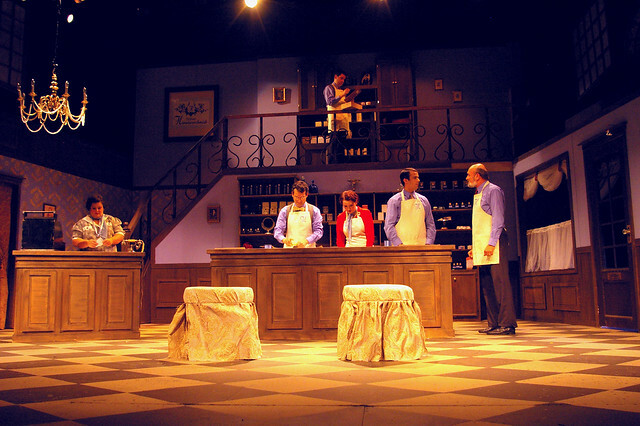 If you’re looking for a “new” Christmas “classic” to enjoy, go pay a visit to Parfumerie, playing at the Metro Theatre through November 29.